Hey, here's something we could use more of. Action scenes. Now when I say that, you all are thinking "combat," but that's not the only sort of action I'd like to see. Let me give you some examples. In BF1 Morgansfort, the scene depicted on the title page, done by Steve "Carjack" Zieser, shows the party waiting while Barthal picks the lock. 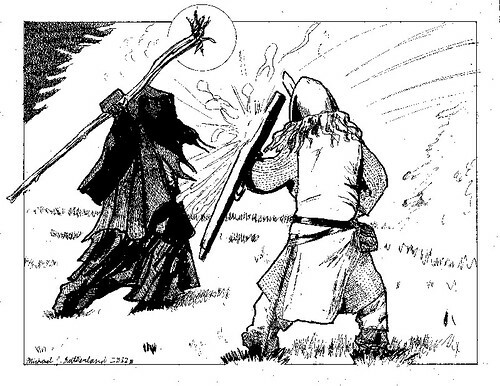 In the 2nd Edition Core Rules there's an illustration in the early part of the book by Luigi "artikid" Castellani showing a magical duel. Also in the Core Rules you'll find Carjack's illustration of an adventuring party and a party of trolls about to meet at a corner in the dungeon. Of course, fight scenes are good too, like the one on the cover of BF1 Morgansfort. Action scenes can be fitted into a variety of places, especially if they are in the landscape layout. I have a number of places that could take such works, and it'd be nice to have a pool to choose from. If you've got 'em, or want to draw 'em, feel free to post samples here, but remember I'll need full-resolution copies to make prints from. Carjack's illustration of an adventuring party and a party of trolls about to meet at a corner in the dungeon is my most favorite art of any RPG ever. If you've got 'em, whip 'em out! Any takers for this one?! Yeah, we can use that! I'm thinking it would fit into AA1 somewhere. Heck, it might be the cover art. A couple of things: This is originally a pen-and-ink drawing, right? Could I talk you into scanning it at 300dpi or higher in grayscale, rather than black and white, and sending the result directly to me? Scanning drawings in grayscale is always better than black and white, since it preserves shading and smooths curves. Don't forget to tell me how you want to be credited. Sudsy wrote: Any takers for this one?! Nice, very nice. I also like the others you have in your art thread. Good Stuff. Solomoriah wrote: Yeah, we can use that! I believe I already have this in 300 dpi... I'll take a look. You prefer greyscale .tiff or .png (I'm not fond of .jpg but will gladly do that if that's what works for you). Okay, I'll be sending you an email shortly! Found the original and am re-scanning. I REALLY like the one where the warrior just opened the door and you can see all the undead beyond it. I think we've all faced something like on an adventure or two..